As a pediatrician, it is my goal to help children grow up and thrive in a healthy environment. Communication, both with parents and with the child, is the key for making decisions. I try to balance all aspects of health – the body, the mind, and the spirit – in arriving at these decisions. Each time I make a medical decision or recommendation, it will be made from a rational and scientific background, balanced with a compassionate and practical approach." 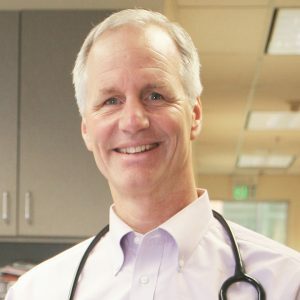 A native of Portland, Dr. Moshofsky grew up in Raleigh Hills and attended Oregon Health & Science University for medical school and his pediatric residency. He has been practicing pediatrics since 1986. Dr. Moshofsky and his wife both admit that much of their knowledge and parenting skills were learned “on the job” and not from books. Their four children have been a joy to raise and are a source of pride. Yet, each of them has provided him with challenges in parenting that he has used as examples for counseling parents in his practice. He has been very involved in his church, teaching Sunday school and parent education classes, as well as completing short-term missionary work in a variety of countries. While his kids were young, you might have found Dr. Moshofsky out on a ball field enjoying another type of practice. He loved coaching youth sports, especially baseball and football. He believes that the “life lessons” learned from participating in sports follow children into adulthood. Dr. Moshofsky currently serves on the board of directors for nonprofit group Compassion First, which provides long-term aftercare for girls rescued from sexual trafficking. After learning about this terrible problem, he realized he could be an advocate for these children and felt compelled to get involved. He shares this passion with his wife, Sarah, and just recently returned from Indonesia working to benefit these girls. "Dr. Moshofsky is a fantastic pediatrician. We’ve been seeing him for 11 years. He always engages the children at the most age appropriate level, provides great advice and encouragement and answers any and all questions without judgment. We moved and now drive 75 miles to visit him. He has also helped connect us with additional special needs services for my son. My daughter now wants to be a pediatrician in large part because of the quality of care she’s received from Dr. Moshofsky." "Dr. Moshofsky is the 'Mr. Rodgers' of pediatricians! He’s so kind, passionate about what he does, and is loving toward my whole family. As much as it sounds strange, I look forward to all my visits for my baby girl. It’s so encouraging and comforting to know she is in the BEST hands. ❤️ I will also add that the nurses, MA’s, and desk staff are wonderful too!" "Dr Moshofsky and nurse Sweeney are both incredibly considerate and observant. They take time to really listen to patient and parent. They explain to kids the importance of doing things to maintain health, such as brushing teeth and eating vegetables, in a way that impresses them to actually comply much more than they would for just the parent! We have really appreciated working with such a great medical team." "I will be the crazy lady trying to take my grown children to their pediatrician until dr. Moshofsky retires ❤️"
"We LOVE metropolitan Pediatrics. We honestly could not ask for a better pediatrician for our son than Dr. Moshofsky. He is so kind and patient and takes time with his patients to let them know they’re concerns are heard and their accomplishments are celebrated. We have been here for almost two years and haven’t had a single negative experience. Thank you for all you do staff of metropolitan pediatrics!"